The Don River and the surrounding Valley has a rich history in shaping and influencing Toronto’s identity. Formed thousands of years ago by an ice age, the waterway became home to small groups of nomadic hunters. Human settlement can be traced back as far as 7,000 years ago. Slate tools left behind by the Indigenous Peoples were discovered in 1886 during road building near Riverdale Park East. The Indigenous groups that called the Don Valley home were drawn in by the value of the waterway. Women made pottery from the surface’s clay deposits and Wendat longhouse villages were developed along the river starting in 1300 when corn became a staple food. In 1700, Mississaugas moved into the region, seeing the Haudenosaunee withdraw south of Lake Ontario. 1787 saw the problematic “Toronto Purchase.” Believing the purchase to be a rental of the area, and not the release of their rights to the land, the Mississaugas surrendered most of the land that would become York, and then Toronto, to the British. The Mississaugas opened a land claims settlement process with the Canadian government in 1986. In 2010, the claim settled in favour of the Mississaugas of the New Credit First Nation for $145 million. 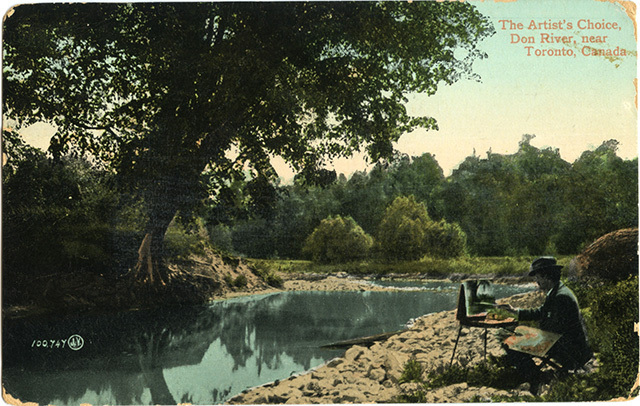 The Don River and surrounding Valley has played a vital role in the development of Toronto. In 1795, the first sawmill was erected at Todmorden Mills, quickly followed by a paper mill and brewery. These industries used the River to power their plants, and the industrialization of the Valley began. Railways came next. 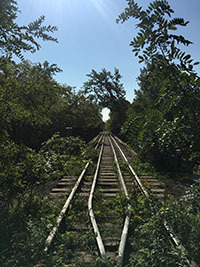 The remnants of rails built in the late 1800s by the Canadian Pacific Railway can still be seen today during a walk in the Valley and through the Park. 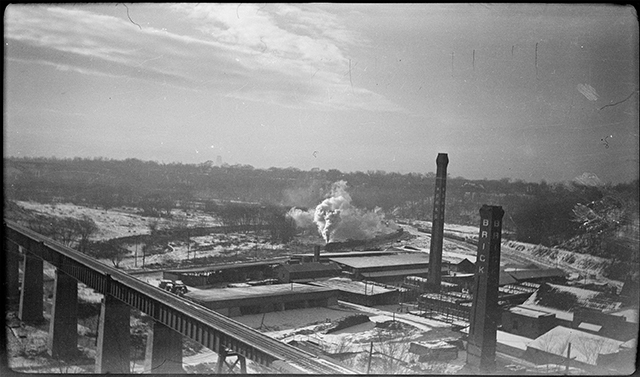 The Taylor brothers, who operated Todmorden Mills, developed the Don Valley Brick Works in 1889, creating bricks out of the clay deposits found in the earth. Now the Evergreen Brick Works, the site is home to 16 heritage buildings and the adjacent 16-hectare Don Valley Brick Works Park that includes wetlands, hiking trails, and wildflower meadows. But where economy boomed, ecology and culture suffered. Torontonians used to enjoy the Don River Valley: it was a community focal point, accessible and celebrated as a part of Toronto’s early identity. Imagine a Lower Don river teeming with salmon and flowing through wide marshes and up against banks lined with trees. Such was the reality for the river in the 1800s, but over the last 200 years, the Don watershed has faced immense pressure due to human settlement and urbanization. Hard paved surfaces encourage flooding, as they prevent stormwater from seeping into the soil or being soaked in by plants. Sewers, carrying both stormwater and sanitary sewage, flood into the river during large storms, which occur more and more frequently with the changing climate. We are facing these challenges by encouraging dialogue and creative designs as well as supporting the city’s infrastructure projects. We’re envisioning the Don River Valley Park to be one of the largest environmental restoration projects across Canada. The Don River was actually straightened. The lower portion of the Don used to meander its way through marshland to its mouth at Ashbridges Bay. In the 1880s, the river was straightened to accommodate industrial development in the Port Lands and allow polluted water to flush into the lake. The Port Lands used to be home to one of Lake Ontario’s largest marshes. A lot of the wetlands were destroyed by municipal landfill between 1912 and 1925. The River was a place to swim. In the hot summer months, residents flocked to the Don River for a swim, perhaps at one of the River’s “bare-bottomed” beaches. Some people even had vacation homes along the River. 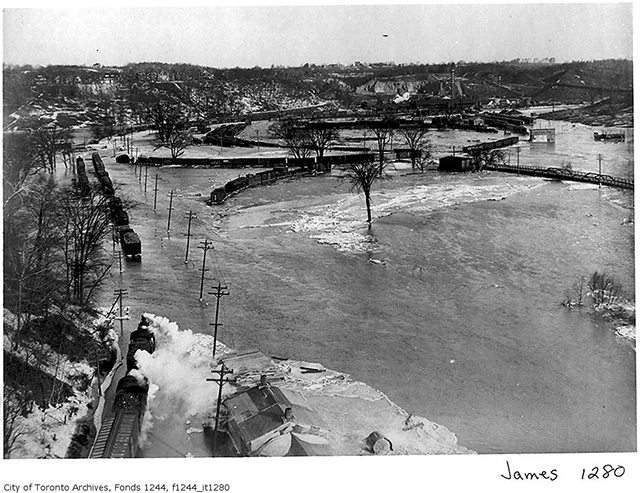 Hurricane Hazel caused the Don and Humber rivers to flood the city. Nowadays we know how the Don can flood in times of sudden rain, but in 1954, Hurricane Hazel forced the entire city underwater. The Metropolitan and Toronto Region Conservation Authority was created in the wake of the flood, and among its defining achievements is the acquisition of ravine lands. The Don Valley was the place to ski. Citizens of Toronto didn’t have to travel very far to be able to put on a pair of skis in the 1930s. The city even operated a ski hill in the Valley. The Don Valley Parkway opened in 1961. 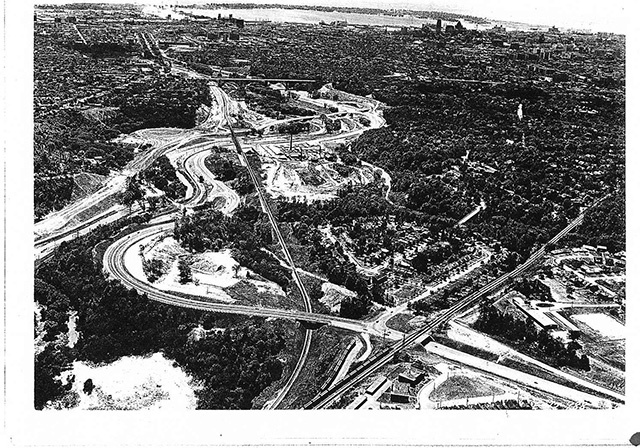 Proposed in 1954, it wouldn’t be until 1961 the parkway would open, forever changing the Don Valley. The hills of the Valley were modified and other natural areas destroyed by the creation of the highway during the post-war boom in Toronto.